Ehrgeiz (エアガイツ, Eagaitsu? 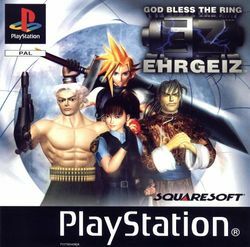 ), fully titled Ehrgeiz: God Bless The Ring, is a 3D fighting game developed by DreamFactory and published by Namco in 1998 for the arcade platform. It was first ported to the PlayStation and published by Square in 1998, then to Japan's PlayStation Network by Square Enix in 2008. Perhaps the most noteworthy feature of the game is the inclusion of characters from Final Fantasy VII: Cloud Strife, Tifa Lockhart, and Ehrgeiz's sub-final boss Django (resembling Red XIII) are playable in the arcade and the PlayStation versions; in addition, Sephiroth, Yuffie Kisaragi, Vincent Valentine and Zack Fair were also added to the PlayStation version's roster. This page was last edited on 22 April 2012, at 06:43.